I don't really understand what this game is about. Would someone like to elaborate? I looked at the webpage and all I garnered was this is similar to the Sims. But given all of the hype, I'm assuming there is more to it than that. sticky felt is your friend. me either, but I have a friend who is obsessed with it already... she's telling me i muusstt get it. I'm not so sure, however. oi. eventually this will be something cool. You know, once I stop being lazy. I am socially awkward. Have pity. I'll try to explain it as simple as I can. It's a sandbox sidescrolling platform game with 3 levels of depth. All the levels in single player can be created by anyone because of the powerful and intuitive engine. Everything is built around the physics and no matter how skillful you are at it, it's just fun. It's also extremely polished for a sandbox game. One of the huge things is the charm of the game. The style and music really make it. You play as a "sackboy" and as you play through single player you collect items for your sackboy (and also items for creating levels) and you can dress it up how you want. You can control it's emotions very easy and even his arms to wave or punch depending on the set emotion. This is the best way I can summarize it but it's really hard to even scratch the surface on how awesome the game is without playing it. If you have a PS3, you need to have this game. pinkpanther - Nothing at all like The Sims. I don't even understand how you made that connection. The website talked about creating your own world. It really didn't say much of anything else. It just kept talking about how it could share everything. It, however, never mentioned what you could share. Now I think I understand. I am curious how all these tools work on the PS3 without a keyboard or mouse. 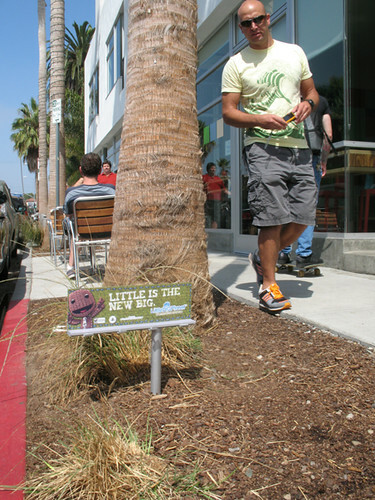 I just saw a really cute "outdoor sign" for little big planet -- it's a relatively small version of those large billboards you see on motorways or busy streets only, this one's less than a foot tall! I was going to take a photo of it but didn't have my camera handy. like the ones when you follow chase's link?